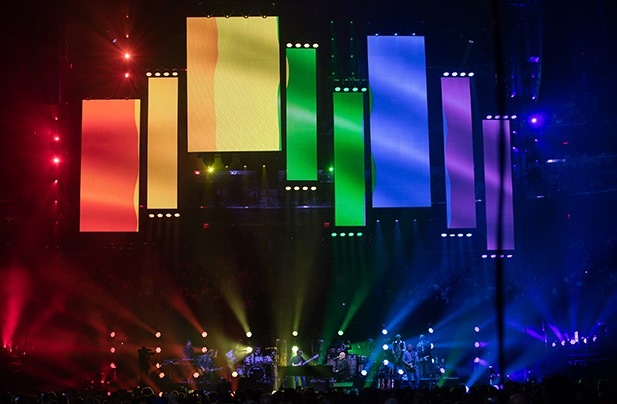 Billy Joel Dedicates His MSG Concert To The Orlando Victims – Perfoming His Rarely Heard Song “You’re Only Human”. You have seen and will continue to see many articles about Billy Joel on MasterClassLady.Com. I think he is one of the most prolific and gifted performers on the planet. His compositions cross multiple genres, having broad appeal to the mass audience. Additionally, he is one of the most generous performers. He embraces his audience and they embrace him back. It is truly a mutual admiration society. Case in point: Billy recently dedicated his concert at Madison Square Garden in New York to the victims from the Orlando tragedy last week. In particular, he performed his uplifting song, “You’re Only Human (Second Wind)” for the first time since 1987. It is such a great song – very catchy and in contrast to the many ballads that have been dedicated to the Orlando victims by other artists. I confess – I was expecting a slower song. Weren’t you? It punctuates strength and courage in the face of opposition. Very, very nice. Prior to the performance, Joel spoke of “the shock and the sorrow” of the terror attack on the Pulse nightclub that killed 49 people in Orlando. The song – from his Greatest Hits Album, Volumes 1 &2 – is available on iTunes and/or Apple Music. It’s a toe-tapping keeper! MCL, I’ve been a devoted Billy Joel fan since his breakout album The Stranger in 1978. He is in my opinion as you have stated an artist who crosses all genres. His songwriting style is second to none, and I’ve read his lyrics with envy, since I try my best to write lyrics, none even close to the brilliant stories he can tell. I saw him in concert in 1987, around the time he last performed this song. I remember it well, don’t recall the album it was on off the top of my head. He is most definitely at one with the audience, and he takes you for a musical ride that you never forget. In fact, I recall him telling us that he was about to perform in Moscow, that was about 2 years before the wall fell in Berlin. He was quite excited about it, and it was evident in his performance that evening. I have fond memories associated with many Billy Joel compositions. I’m trying my hand at playing Just The Way You Are, and it is one complicated piece of music. I do believe he mentioned he was classically trained on the piano, and it certainly is apparent. Music heals, and that’s a fact. It’s helped me through bad times, and I suspect will help all those left behind from the violence in Orlando. Oh, wow–Billy Joel has been one of my favorite musicians from my high school days, and I had every one of his albums in actual vinyl! I recall that in the recording of “You’re Only Human” there is a bit where he messes up the lyric and laughs. That was a real error during recording, and rather than doing another take he left it in since that was exactly what the song was about. Makes me smile every time!